So far May has been a busy month for Visual Realm (and it’s only day #2)! We’ve launched two new web sites with the possibility of 2 more going live by the end of this week. 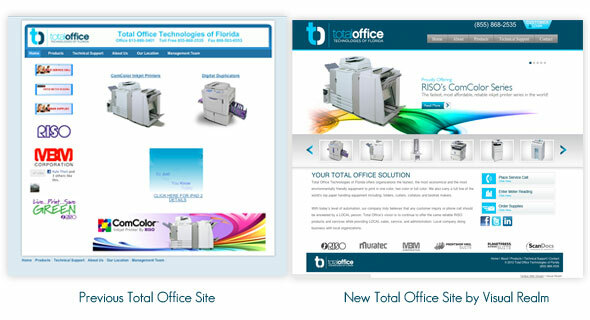 The site we will be highlighting in this post today is a rebrand for a company called Total Office Technologies of Florida. Total Office is a leading distributor of Office Equipment such as printers, copiers, scanners, fax machines and pretty much anything else office related. They originally came to Visual Realm for design and printing of their business cards, but this quickly turned into discussion about how to upgrade and rebrand their current web site. Some of the top requests from Total Office were to have a web site that gave them credibility to potential buyers in the market, a product section that displayed their product line in an organized way, and social network integration. The new site features A LOT of the really cool JQuery animation to showcase the hundreds of products they sell. The home page alone has two sliders to direct customers around the site. Once a potential customer gets to the product pages, they can flip through each section with a click of a button. Please let us know your thoughts on the new Total Office and be sure to check back this week for updates on the other sites we’re launching.